There are many apps out there to help with meditation such Headspace, Calm (my previous favourite) and Oak (which will have a major upgrade in October, so one to watch), but my preference is this one that focuses on breathing. Apnea Trainer was originally designed to help improve the breathing technique for free divers, so it has lots of exercises to extend your breath cycle and even how long you can hold your breath for. It also has a Pranayama training mode – a breath control technique that has its roots in Hinduism and Buddhism, so it is well tested over time! I use this mode for around ten minutes a day on my train ride to work as my form of meditation. Most people tend to use Safari or Google for browsing, but I often find them slow or too intrusive. I discovered this new browser app, which removes ad-trackers, malware and lots of other junk that gets loaded with each page to capture your data. 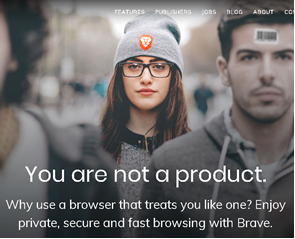 As a result, Brave loads the pages super-fast. The browser also shows you how many trackers and ads it has blocked. Other good privacy-oriented browsers are SnowHaze (my previous favourite) and Onion Browser (good for anonymising your IP address, but slower as a result). I find the native Apple podcast player too slow and clunky and so I have switched to Overcast. It’s fast and has some nice features such as timers, variable speeds and voice boosters. Most people tend to use Twitter to track updates from their favourite content providers (news, writers etc), but I much prefer using this RSS aggregator “Feedly”. In the app, you select the website you want to “subscribe” to, and then Feedly will pull in (via RSS) any new content from that site. I have folders for different subjects, so in my “Creativity” folder I have feeds from sites such as Colossal, Kottke and Seth Godin and in my “Finance” folder I have feeds from Marginal Revolution, IMF Blog and VoxEU. I scroll through these every day, filter the best and then send out as my “Best of” email each week. 5 PS Express (photo editing). You can edit inside “Photos” or “Instagram” but sometimes you want to have more extreme edits than just changing filters. This app allows you to touch up parts of the picture, change the shape of objects and has a great selection of filters. Apple Notes. I’ve recently switched to using the native “Notes” app for taking notes instead of Evernote (too slow and has trouble saving links). I tried Microsoft’s OneNote for a bit, but found that to be too slow as well. I’m not sure if these work faster on Android. Soon – I use this to record book/TV/film/restaurant recommendations. Helps me reduce impulse buying and also provides a way to track restaurant tips for cities around the world. Waze – I use this for avoiding traffic when driving. It can get quite crazy taking turn after turn to save 30 seconds, but I’ll forgive it.